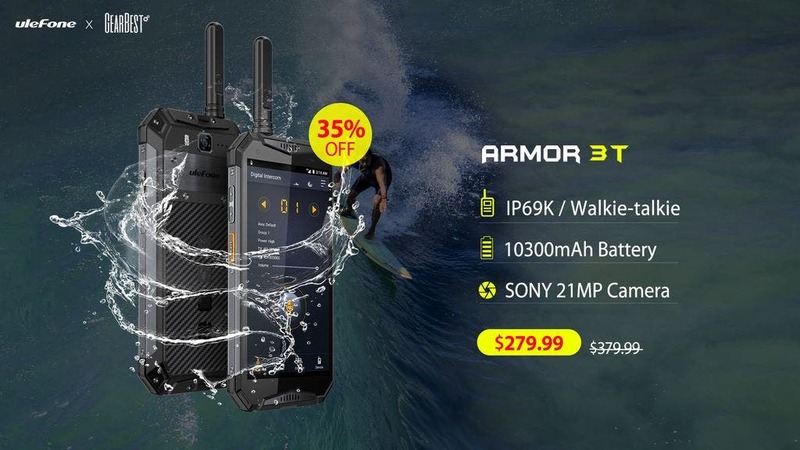 The new world’s first rugged walkie-talkie phone Ulefone Armor 3T is already out of the crowdfunding platform and finally normally available on the market. In order to celebrate the successful launch you can currently get it in a special promo event lasting a week, where the price is slashed by $100 and also coming with three free gifts worth another $60. Pretty good stuff i would say. Ulefone Armor 3T is a carbon copy of the Armor 3 with added bonus of the digital offline walkie-talkie intercom function. So you can expect IP68/69K certification and MIL-STD-810G military grade standards, 5,7-inch FHD+ display, Helio P23 processor, 4 GB RAM, 64 GB of internal storage, 10.300 mAh battery capacity, Sony 21MP rear camera, 13MP selfie cam, fingeprint ID and Face Unlock, NFC with Google pay support, global LTE bands or the Android 8.1 Oreo system. The special offer cuts the price for a week only to $279.99 and you will get the free clip, bike/carwheel holder and sling as bonus free accessories. You can also learn more about the phone on Ulefone’s official website.